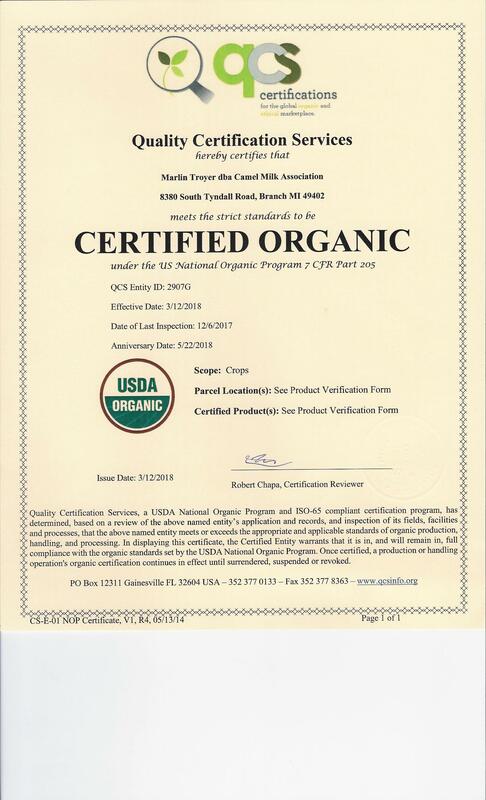 Our camels and the milk are/is not certified organic, However most of the feed they eat is certified because we raise our own hay and pasture, which is the majority of their diet. Our Camels are on Grass free choice from the first greening in the spring till the ground in covered in snow in the fall. All the milking camels are Corn and soy free and we feed no GMO crops on the farm we are Gluten free as well. and now re-certified in 2018. We produce 99% of all our feed on our own land. The dairy camel also get a bit of feed we mix our self as a treat during milk, this consists mostly of oats, Alfalfa along with sunflower, flax seed meal a bit of molasses and organic wormers salt and minerals. We are confident in the health and safety of our program and And seek to stay on the cutting edge of new improvements as we discover them.